When we hear reports of mass shootings, we can recognise the actions of, in the case of the forcibly nameless Anders Behring Breivik, a complete stranger in “human” terms. Tragedy without character is comprehensible, but it remains impersonal, however empathetic one may be. So how do we understand beyond the ‘what’ without character motivation? How do we make sense of the senseless? 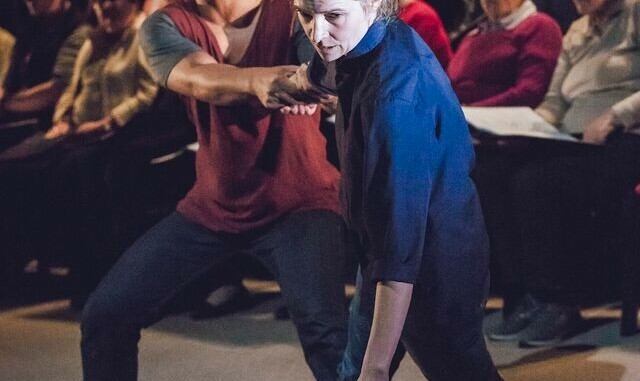 This is the question that impels choir leader Claire (Tandi Wright) on a journey of discovery, not only of The Boy (Beulah Koale) who perpetrated the titular events she survived, but of herself, and it is the latter that provides the dramatic shift in David Greig’s play; the focus of conflict from the external to the internal. 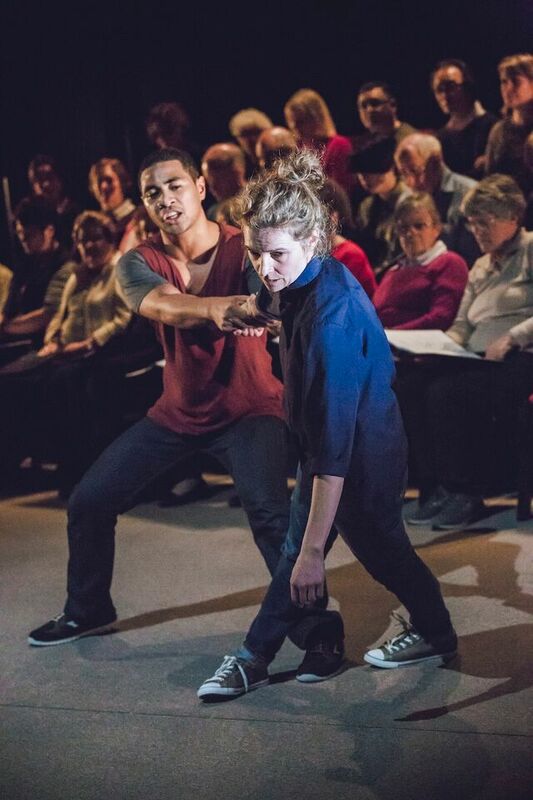 Said shift occurs as Claire confronts various characters; her partner, her psychologist, The Boy’s father (all played by Koale), who act only to catalyse the innate absurdity of the question itself. There is no answer to this question – but that doesn’t mean we shouldn’t seek one. Koale’s intensity when addressing the audience as The Boy is unrelenting, reverberating throughout the entire theatre, although his vocal and physical specificity with his multiple characterisations is slightly lacking. There is also a hint of vocal restriction and consequently emotional depth from both Koale and Wright, but, overall, their commitment is compelling. Repetiteur Robin Kelly leads the Handle Quire on opening night, and both provide a poignant juxtaposing naturalism to the onstage drama. Simon Coleman’s use of simple set in expansive space imitates the empty grandeur of the community hall, which, in turn, evokes an ironic sense of isolation both physically among the 30-member opening night cast and communally within the 200+ seat theatre. 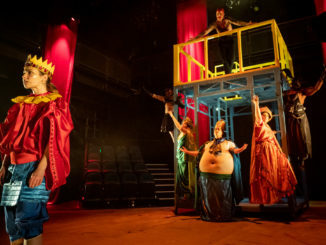 This sense of community, which is inherent in both theatre and choir, is a central theatrical convention in Greig’s play, evoking the Greek chorus, aiding, never detracting, from Claire’s journey. Director Sophie Robert utilises this convention, and the dichotomy of space and the components within, generating moments of both complete abandon and intimate connection with extreme catharsis. But the catharsis does not come with an answer, because, ultimately, there is none other than the one the person asking the question accepts. If violence is the question, then art is, at the very least, one response. These discussions should not remain relegated to the pages of an Internet blogsite; they are the epitome of why we gather together to be presented with a playwright’s truth. There is a plethora of material to discuss in the events of The Events, and even more to be had when considering the full perspective of the other end of the gun. The conversation is endless. 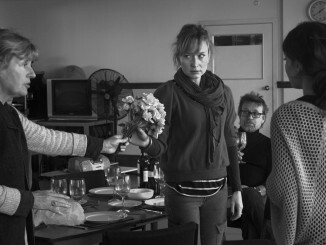 The Events is a production that not only has the potential to grow organically via the performer’s exploration throughout its season, but also has the added theatrical element and marketing angle of a new choir performing each night, which will result in an inarguably new show with every performance. This, in turn, means that it can be viewed multiple times, each with a genuinely unique experience for the audience, and, being the best main-stage show this year, there’s no reason not to get your soul back. 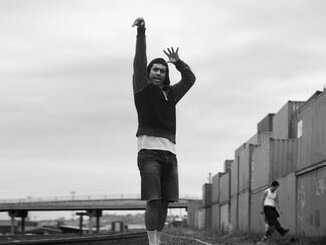 The Events is presented by Silo Theatre and plays at Q Rangatira until September 6. For details see Q.